Thirty-eight organizations in New York and New Jersey are asking the governors to join them in opposing a proposed pipeline that would carry crude oil from the Port of Albany to refineries in New Jersey. There are no formal plans yet, but environmental and grassroots groups say they want to be ahead of the game as Pilgrim Pipeline Holdings ramps up proposals for an East Coast oil pipeline. 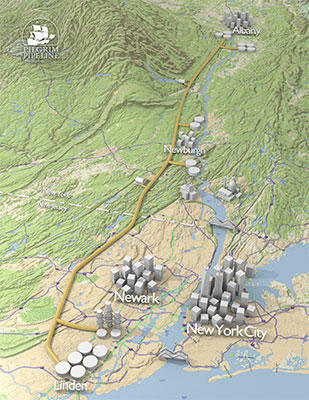 The concept is to allow the transport of oil from the Port of Albany to the Phillips 66 refinery in Linden, New Jersey. A coalition of groups from New York and New Jersey opposed to the project held a conference call Tuesday. Pilgrim Pipeline plans to submit applications to the appropriate state agencies sometime this summer to begin the permitting process. New York Governor Andrew Cuomo has written to President Obama requesting immediate action to enhance rail safety as the state experiences a boom in rail transport of explosive Bakken crude oil. The number of crude oil tanker cars being hauled on trains south from Canada to the Port of Albany has increased substantially over the past year. Several environmental groups are expressing concerns over potential accidents and demanding action. After oil train explosions made headlines on several occasions, residents in communities along the Hudson River became aware of the grave dangers in the day-to-day transporting of crude oil by rail. Governor Andrew Cuomo called for a crude oil training drill Wednesday. Government officials and residents of Albany's South End neighborhoods have expressed concern about potential impacts related to crude oil transport and facilities in the area. The New York State Department of Environmental Conservation is rolling out an air sampling plan to screen for specific pollutants in the community. Aside from worries over spills or derailments that could result in untold ecological harm and potential civil disaster, strange odors occasionally waft through downtown Albany neighborhoods, a constant reminder that oil trains are parked nearby.